A great doctor with a wonderful personality! During my first visit, she made me feel welcome and comfortable. Would definitelybe going back for another visit. A great doctor with a wonderful personality! During my first visit, she made me feel welcome and comfortable. Would definitely be going back for another visit. After my excellent visit with Dr. Akinnuoye, I can personally say that I have never had a more pleasant experience. Iwill not only be returning, but I will be making her my PCP going forward. After my excellent visit with Dr. Akinnuoye, I can personally say that I have never had a more pleasant experience. I will not only be returning, but I will be makingher my PCP going forward. My visits with her are always GREAT ! She takes her time to explain everything and answers all questions ! HER AND LUCY ARE THE BEST! 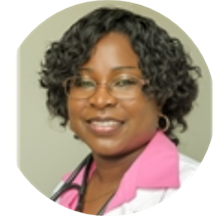 She is an excellent health care provider,been my primary care provider going 4 years, and highly recommended without any reservations. Excellent care! Compassionate, friendly and attentive to patient needs. Professional and caring! Highly recommended. Very professional, compassionate, and concerned about patient needs. Her bedside manner is excellent and I would highly recommend her medical services to everyone. She's always so pleasant! She genuinely cares. Great! She listens and very compassionate to your needs. She always so friendly and welcoming as well as attentive. I don’t feel like she’s just my primary care doctor I can talk to her with ease as I would a friend. Which makes it easy to tell her everything thatis bothering me and she diagnoses accordingly but never too much. I love her. Easy to talk to. Would definitely recommend!!!! Very thorough! Adressed my issues immediately. The doctor and nurse were extremely nice and friendly! The only turn off was the office location, which looked somewhat old and run down, however the staff was extremely helpful and kind. She was extremely friendly and responsive to my questions. The office is very clean and professional. I will probably make her my PCP! Nice office! Nice and friendly staff highly recommended! She was very thorough and very easy to express my concerns to. I would highly recommend her to anyone seeking medical care. Dr. A is very calm and attentive. She also has a very welcoming persona and great bedside manner! I would recommend her to everyone. Professional and kind bedside manner. Had a pleasant visit, was professionally concerned and informative about my health. Staff was very friendly. Doctor was friendly, knowledgeable and helpful. Very easy to talk to. Dr. Olayinka Akinnuoye was absolutely amazing! She was pleasant, funny, and very informative. Highly recommend! I had a really pleasant experience with both Dr. Akinnuoye and her staff. The office was clean and quiet and I was seen almost immediately upon arrival. I received the doctor's full attention and never felt rushed. I love Nurse Akinnuoye, she is truly the best, and so so sweet. She was very professional and I didn't have to wait. Perfect for me. Not a real busy office. Pleasant staff, real helpful. It was quick, professional, and very friendly. She really cares about you having a good health. Its always a pleasure when seeing Dr. Akinnuoye.. Nice, Down to earth Professional Dr..Im always seen right away, What more can I ask for? It was great. I'm making her my primary doctor. Go see her! She's wonderful! The visit was great they as soon as I got there they took care of me , great team work. I was treated to my expectations! I would highly recommend her to many! !